Anyone remember the tiny little review I did ages ago for a tiny game called Love Letter? Well, apparently that tiny little game has spawned a tiny little parody. World, meet Munchkin: Loot Letter. You know it’s going to be silly if it’s in the realm of Munchkin. A quick refresher: in Love Letter, your goal is to get your love letter to the princess. You’ve got a small deck of cards which are numbered, and there are various amounts of those numbered cards – there are far more of those lower number cards than higher number cards, and there’s only one 8 – the princess. Once you get the princess, you pretty much win the game unless someone forces you to discard her. Well, Loot Letter is pretty much the same – only there’s no princess. Only loot. And Ducks of Doom, and a Dread Gazebo. And a lot of potted plants. I got the chance to play Loot Letter with some dear friends over dinner recently, and it was quite a bit of fun. J and Kasi had played it on their own previously, and found out there’s a lot less strategy involved and a lot more luck when playing with just two players. Adding a third player, though, made things more fun, and introduced more strategic moves to try and win the loot. Even though I goofed up a few times by not entirely thinking through some of my moves (like using a Dread Gazebo to swap hands with someone without really thinking about the effects of someone else ending up with the cards in my hand), I somehow managed to win the most loot! 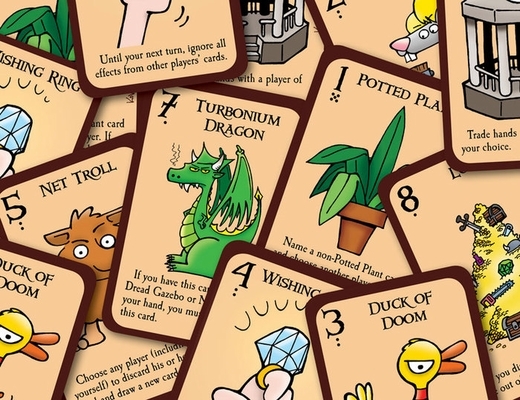 If you’re in need of a short game to pass the time while waiting for food at a restaurant, or for a TV show to start, but don’t feel like something sappy, then Munchkin: Loot Letter is the game for you.